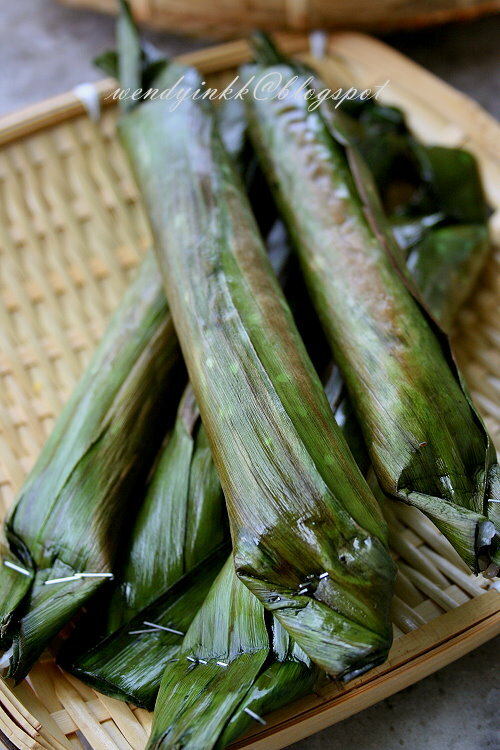 A lot of us are used to Pulut Panggang. 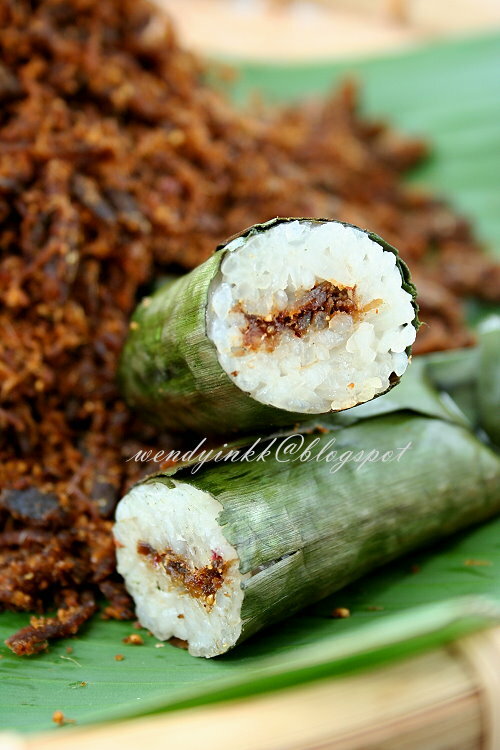 Those that I ate before are either filled with a spicy coconut sambal or a dried shrimp sambal. But on the east coast.... this is not the usual case. In Terengganu, the rice is infused with fenugreek and filled with a moist coconutty fish filling, whereas in Kelantan, the rice is just with the usual coconut milk and salt, BUT, sweet. Yes, it has a heavy tinge of sweetness, but not sweet like dessert. And the filling is no other than the famous beef serunding. I used Kak Wan's recipe, of which originally used the steaming method. I on the other hand, chose the easier way out that is to 'steam' the rice in the microwave. The end result is drier (My bad!) and so I have rectified this recipe below to have slightly more liquid. Steaming actually introduces moisture to the rice, but zapping it in the microwave doesn't, so we have to manually 'introduce' it by using more liquids. 2. Drain the rice andplace it in a microwave safe vessel (I used corningware). Cover and zap it on high for 5 minutes. 3. Meanwhile, mix salt + sugar and warm water together until the sugar melts. Mix in coconut milk. 5. Let the rice sit for 2-3 minutes and then zap it for another 4 mins on high. Let the rice sit until it turns warm and manageable. 6. 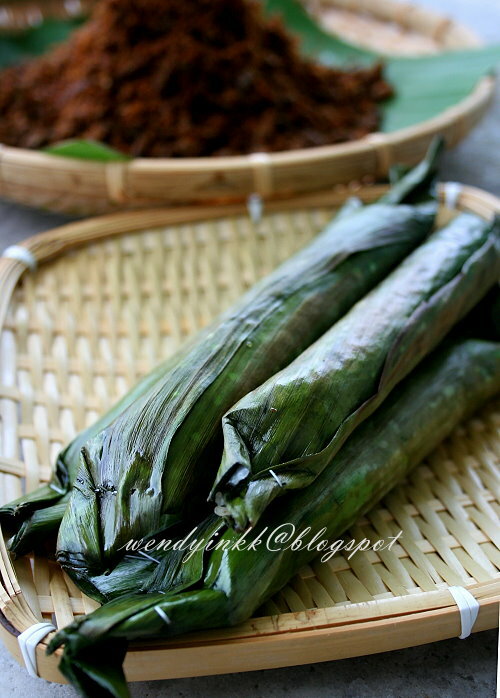 Meanwhile, wilt 8 pieces of banana leaves (can either do it over an open flame or blanched in boiling water). 7. 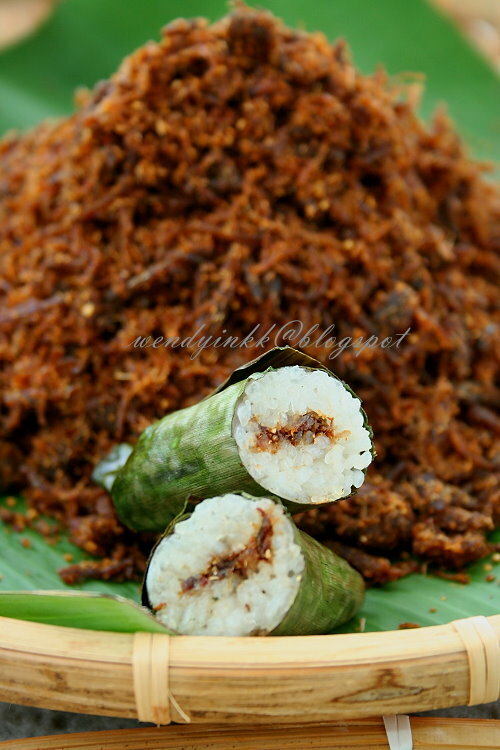 Place some rice onto the banana leaf, lightly wet hands and flatten the rice. Place some beef serunding on it, then roll up and secure the edges with either toothpicks or staples. 8. Lightly brush the rolls with some oil and grill the rice rolls over open flame or pan fry them in a large pan. Wendy, I sudah lama did not eat pulut lepa. It is one of my childhood favourites. I did not know that in Kelantan it is rather different using beef serunding. Must be very sedap! This looks like pulut panggang in my place. Using microwave sound so easy. Can I use store bought beef serunding for the filling? I have enjoyed your Kelantan delights series so far, they all look so delicious!